If you don’t receive enough far infrared ray (FIR) from sunlight, you may become unwell or depressed. ALL life forms – humans, animals and plants – need Far Infrared to remain healthy. Thousands of us are searching for ways to relieve pain, detox, relax and stay well due to stress filled lifestyles, toxic medication, acid fast food diets and toxic environments. 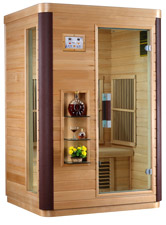 One solution is the natural healing of the far infrared sauna. Far Infrared Rays penetrate 4-5cm/2 inches into the dermis (middle layer of skin), from muscle into blood vessels, lymphatic glands, nerves and cells. The effects of far infrared rays weaken with distance, so the closer to the source of the far infrared rays your body is, the more impact they will have. Detoxifying the body helps in safe weight loss. People who have unsuccessfully tried many diets often find success with a far infrared sauna because they are able to eliminate chemicals stored in the fat cells. This makes safe weight loss much easier. It effectively reduces heavy metals which have been directly related to metabolic imbalances in the body causing poor digestion and weight gain. It decreases fat stored toxins (lipophilic). Often safe weight loss cannot be accomplished unless these toxins are first removed. It burns calories to produce sweat. It takes 586 calories to produce one gram of sweat. You can easily sweat 600 plus calories in a single sauna session. 2) Excellent for alleviation of rheumatism, arthritis, gout, and reducing the density of uric acid. 3) Excellent for clearing breathing problems such as asthma, sinusitis, allergies and bronchitis. 4) Very good for relieving paralysis, sciatica, insomnia, neuralgia, abnormal nerve functions, high blood pressure and chilblains. 5) Relaxes muscles and relieves muscular ache – Reduces back, shoulder and neck pains. 6) Excellent for reducing swelling, inflammation and associated pain. 7) Stimulates lymphatic cleansing – Enables elimination of toxins, lactic acid and carcinogenic heavy metals. Excellent for serious detoxification. 8) Stimulates blood circulation – Very effective for chronic nephritis patients, reducing blood pressure and improving urination. Effectively improves and can eliminate piles and hemorrhoids. a) Decreased muscle spasms, pain and soreness. b) Reduced swelling and inflammation, by improving lymphatic flow. c) Removal of heavy toxins – metal poisoning and chemicals – due to activated metabolic activity. a) Improved oxygenation exchange and accelerated metabolism. e) Relief from breathing and lung challenges. A functional blood circulation system is indispensable not only for a quality life, but also to maintain health. If blood circulates well, tissues will receive the energy in the form of nutrients and oxygen to help the metabolic activities they need, as well keeping the heart healthy.